Some people like giving – and receiving gifts – to their significant others. This is a great way to show you care, and we have suggestions for gifts in this post. But have you considered writing him a love letter, instead? In modern times, sending a love letter might seem a little dated, but it also makes quite the statement to your recipient because it’s so uncommon in this day and age. There are plenty of benefits to the love letter, too. It’s much cheaper than buying a gift or planning a fancy date – ideas here. You can take as much time to say what you need to say, and you don’t have to be nervous because you’re not saying it to his face. You can draft a love letter and rewrite it three times until you’re happy with it. Or you can quickly scrawl a few words on a Post-It note and leave it on his pillow when you leave. There’s tons of freedom when it comes to writing your love letter, and we’ve got the best advice to help you learn how to write the perfect love letter. Before you actually write the letter, you should know how you intend to send it. This prepares you to buy an materials you need and helps you format your thoughts in the appropriate way. 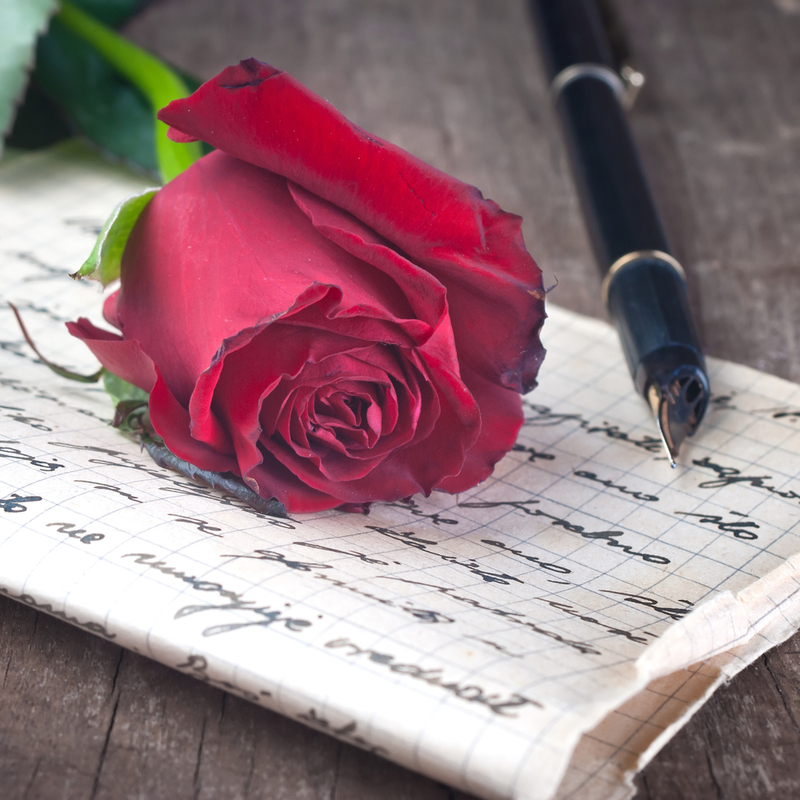 Here are some of the pros and cons of writing a love letter in different mediums. Snail mail: When you actually take the time to write a love letter, add a stamp and send it in the mail, it can show more forethought than just sending an email or a text to your man. This is especially true if you pick stationery and stamps to go with your theme. You can add personal touches by kissing the envelope – known as sealing it with a kiss – or spraying a bit of your favorite scent on it so it will smell like you when he opens it. If you’re in a long-distance relationship, one of you is deployed, or you’re on vacation, dropping a letter in the mail shows your guy that you’re thinking about him no matter how many miles are between you. More tips on LDRs in this post. It doesn’t have to be a long, drawn-out letter, either. You can simply pick up a postcard and doodle a few hearts on it. However, if you’re crafty, a homemade card would certainly show that you’ve gone the extra mile! Add a mix CD, photograph or another special touch, and you’re good to go. Perhaps you can leave it with a single rose – if your guy is into that kind of thing, of course. A written note can also be folded up into an origami shape, slipped into his lunchbox or car or left where you know he’s sure to see it! Of course, sending a physical letter has one drawback when compared to digital options: it takes longer. When time is of the essence, sometimes mailing a love letter just won’t cut it. Email: Thanks to social media, email isn’t as common as it once was for personal communication. But emails allow people to easily save love letters they may receive, and you can start a draft and edit it until it’s perfect. Unlike some digital forms of communication, emails have no limits. You can even add images or short videos. You could even decorate them with fonts and different formatting. But unless you’re proficient in HTML or know that he’s checking from a device that has HTML enabled, a plain-text message is the best way to go. Email’s strength is its immediacy, and you can almost be certain he’ll get it. There are no frills, but if you’re confident that your loving words are enough, that won’t be an issue! Text: If email is a no-frills way to send a love letter, than texting offers even fewer features, but there’s an immediacy to it because most people carry their phones on them at all times, and text messages are often checked more frequently. Or you can schedule your message so it sends at a better time. Plus, you can add cute emoticons or emojis. Be careful of the length of your message. Most carriers split them at 160 characters, but you may be able to bypass this by adding a photo with your message. If you want to write a longer message, email may be a better option than text to avoid multiple alerts and the possibility that split messages don’t arrive in order. Social media: Sending a love letter to your boyfriend via Facebook, WhatsApp or Twitter might be the most controversial method to do so. Plus, these messages could become permanently lost if either of you deletes their account. Twitter also has a limit of 140 characters. But if your intent is to send a message that you love your man and no one else can have him, then you might be on the right track by sending him a public message on Twitter or posting to his Facebook wall. These sites allow you to add video or images, too, so you might use an app to edit a picture of the two of you to let him know how much he means to you. Sending a love letter over Facebook or text might not seem special, especially because we so frequently communicate with others via these methods. Also, be mindful of the limitations of your letter method. For example, texting and Twitter have character limits, but they’re perfect for writing a short haiku. Now that you’ve decided how you’re going to send your love letter, it’s time to figure out what to put in it. It’s easy to think using someone else’s words will strike a chord in your lover’s heart – and they just may! But saying it in your own words, even if you think they’re clumsy or silly, will show your man how much you’re trying, and he’ll likely value the love letter you’ve written him all the more because of it! Talk about how you met. Discuss your favorite memory of the two of you. List the things you love best about him. Let know know how he’s helped you improve as a person or get through a difficult time. Explain to him the kind of future you think of with him in it. Compare yourselves to a famous couple like Johnny and June – bonus points if it’s a couple you both like. Add lyrics from your favorite love song or “your song” as a couple. Consider adding inspirational love quotes like this ones here, here and here. Write a poem. It doesn’t have to be long! Sketch a little something. It could be the two of you, a couple hearts or even a scene from your favorite movie/TV show/video game. Creativity shows that you’re being thoughtful. For example, you can’t send a mix CD with an email, but you can include a link to a playlist you made on Spotify or YouTube. You could even include videos you’re made with images from your favorite media while your song plays in the background! Whatever you write, it should be personal. Length will vary depending upon what you have to say, and you shouldn’t feel pressured to say more if it doesn’t seem long enough. As long as your feelings are expressed, your letter is good enough. Don’t be afraid to be a little silly and dorky, especially if your relationship dynamic often incorporates those traits. If you want to include some naughty thoughts, that might be okay, too. Just remember that someone else may read this note. You want to sound like yourself, not like some stranger who is overly formal or, for some reason, speaks in Shakespearean tongue! You’re not competing with anyone or trying to win a contest. The entire point when you write a love letter is to explain your feelings to your significant other, a person who loves you for who you are! The way you end your letter can be just as significant and sweet as the contents in your love letter. It’s not that he doesn’t know who’s writing him the love letter…It’s that this gives you a chance to sum up your feelings. Signing off with “Sincerely” is going to sound formally and likely a little awkward. A simple “Love, [Name]” might be enough. You could sign off as as his “sun and stars” if you’re both fans of Game of Thrones, or use a nickname that only he calls you. You might leave off a signature completely if you’re sending your message via text or Twitter. It not only takes up extra space, but seems odd in those formats. It can feel a little weird to start a love letter. Hopefully, the advice in this article can help you figure out what you want to say and how to say it. While it might be hard at first, you might be surprised at how quickly you get lost in the words. Or you may find that writing a love letter isn’t for you. That’s okay, too. You can certainly plan a special evening with your love, make them something artistically or simply make sure you show your love on a daily basis if professing your love isn’t up your alley. Otherwise, you could end up in an unhappy relationship.